During the meeting it was emphasized the necessity of the establishment of the Regional Working Group (RWG)to be provided for the Regional strategic actions TRACECA on provision of safety of navigation and protection of the environment for the period until 2021. The evaluation of the effectiveness of the project during this period can be implemented only after receipt of the relevant information from the recipient countries of the project. In addition, it is stated that assessing of the current situation and progress of beneficiaries on implementation of tasks of the project, assessment of the implementation of activities, promotion of dialogue at the regional level and the collection of requests. 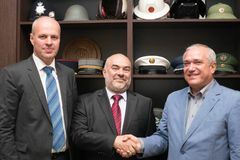 Parties of the meeting underlined that it is to draw relevant complex conclusions, to give concrete recommendations and proposals on achievement of objectives of the technical task of the project and realization of the Regional strategy of actions of TRACECA on provision of safety of navigation and protection of the environment for the period until 2021.